Ohio Department of Natural Resources Director James Zehringer speaks at East Fork State Park Friday, May 16. The state of Ohio will be investing $85 million on capital improvements to modernize the facilities in the state park system, and Clermont County is going to be a big beneficiary of that spending. Ohio Department of Natural Resources Director James Zehringer was at East Fork State Park Friday, May 16 to announce ODNR’s capital improvement plans. 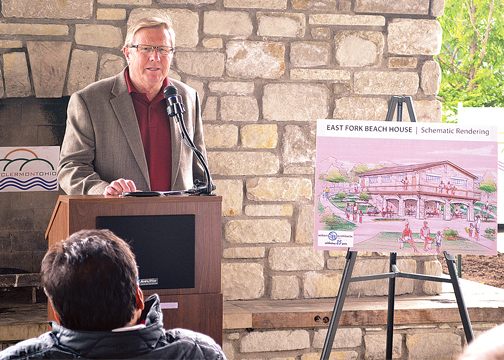 Among the improvements planned for East Fork will be a new beach house, which will include new bathrooms, indoor and outdoor showers, an observation, and outdoor vendor space, and new docks and pull-through campsites. Mark Calitri, executive director of the Clermont County Convention and Visitor’s Bureau, said that the visitor’s bureau formed an alliance with the community, political, and business leaders who worked closely with Governor Kasich and Zehringer to secure this capital investment. He said the improvements that will be made will have a significant short-term return on investment, and will boost the local economy for many years. East Fork will be hosting the 2015 US Rowing Club National Championship next July, and Calitri said that the Visitor’s Bureau is working to bring regional and national races, as well as canoe, kayak, paddle board, water skiing and boat racing to the park. Calitri said that the improvements will make it possible for the county to compete with other regions of the country for large events, which can draw more than 5,000 athletes and spectators who spend money locally at hotels, in restaurants, gas stations, and other businesses. “A rowing event of this scope creates a strong economic ripple effect through our entire community,” Calitri said. 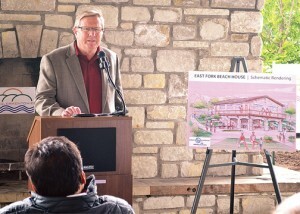 The amount of money that will spent at East Fork has not yet been determined, but is expected to approach $1 million.